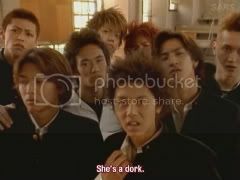 i love Gokusen 1 & 2 but for me the first one is better.. Nakama Yukie is a great actress. then u'll see how repetitive it is in the 2nd and 3rd season! i know that the storyline is always repetitive but it always made me cry! i always love the moral taught in the dorama! 1st and 2nd season the main characters are good! They have the character and are so cute! but for the 3rd season, the main boys seem to lack of something. =x but nonetheless, Yankumi is still cool!! Aaaah, someone who agrees with me!